This religious art tapestry "Holy Trinity (Icon)" shows the work of Andrei Rublev from 1410. This work of Rublev shows The Old Testament Trinity. The original is in the Tretyakov Gallery in Moscow, Russia. He was considered one of the most influential artists of the medieval Russian period of Orthodox frescos and icons. The old testament trinity refers to the appearance of three angels to Abraham at Mamre while he was in his tent in the heat of the day. He offered them food and to wash their feet. One of the three angels told Abraham that his wife Sarah would have a son. Sarah overheard what was said and was doubtful due to her age. The angel then declared that nothing is too hard for God. 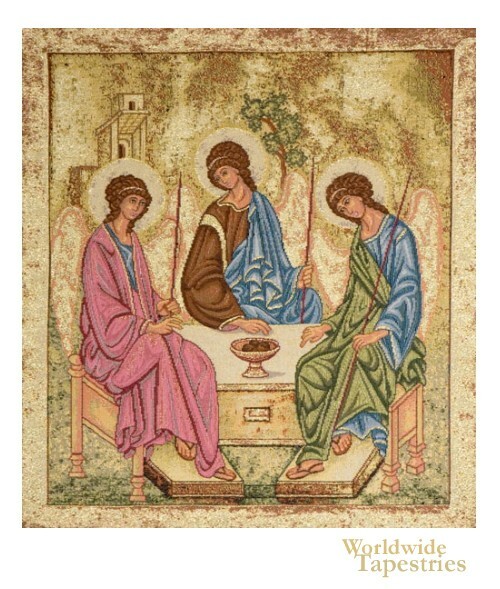 This religious art tapestry "Holy Trinity (Icon)" is lined and has a tunnel for easy hanging. Dimensions: W 17" x H 19"